At the start of TY all of us had to get into groups of three as we are all entering in the Junk Kouture competition. We all must make a dress entirely out of recycled materials. My fellow designers in my group are Alana and Liz. Our dress is going to be completely decorated with BOTTLECAPS. Colourful bottlecaps that we collected from the many pubs in Celbridge. One day myself and Alana went around to all of the pubs collecting as many bottlecaps as we could and now we have hundreds of bottlecaps. So now we spend our Art, Home Ec and TY design classes paper mashaing our skirt and sewing bottletops onto our bodice. 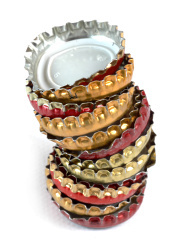 We spent hours at the start of the year with a hammer and nail hammering two holes into each individual bottletop. Hopefully when it's finished it will all have been worth it ! !